"Hmmm. If you must record my exploits I do wish you would put less emphasis on the melodramatic and more on the intellectual issues involved." Sherlock Holmes was born out of Sir Arthur Conan Doyles' incredulity at the problem solving by pure chance in the detective stories he read, and his keen interest in his own and others' psychic abilities. An infusion of these abilities and superior intellect and presence, gave rise to the best known and most copied detective in history, as read in the pages of "The Strand" magazine beginning in July, 1891. After Twentieth Century Fox gave up on their Victorian Holmes series after two films, Universal began this updated version, of which four are here included. After an initial offering, Roy William Neill was hired. He had directed Bela Lugosi in The Black Room in 1935, and he would bring his heavily horror influenced cinematic style to the eleven films he would helm, produce and script (uncredited). It is Neill who gave London its ominous wet-streeted foggy look, to this day as responsible for how Americans consider London as Londoners in turn think Chicago still the home of Al Capone. Others will argue that there are better versions, but I would disagree. If for no other reason—and there are MANY—than that Basil Rathbone is the splitting image of the original Sidney Paget drawings (whose hiring, by the way, was an accident); an eerie reincarnation of this fictitious character, for whom, Conan Doyle says in the rare interview included, he had received mail as if he were real. This is the second film in the Universal series, and the first helmed by Neill, in which Holmes and Watson are pitted against the Nazis in this modern storyline. Attempting to protect Dr. Tobel, a Swiss scientist who has created a secret apparatus that may decide who will win World War II, Holmes dons one of his many now famous disguises to smuggle the professor into England right under the Germans' noses. To keep the weapon a secret, Tobel creates a secret code using stickmen, describing how he has separated the bomb site into 4 pieces, with a different scientist in possession of each piece—but unfamiliar to each other. The Germans follow and attempt to gain this prize for their Fuhrer, in a plan devised and hatched by Holmes' arch nemesis, Professor Moriarty (Lionel Atwill). This film marks the first entry into the series of Dennis Hoey as Inspector Lestrade, the man from Scotland Yard doomed to play second fiddle to Holmes' superior intellect and cunning despite his best effort. This film reintroduces the evil Professor Moriarty, played by Henry Daniell, of whom Basil Rathbone would later say, There were other Moriartys, but none so delectably dangerous as was that of Henry Daniell." Stealing from the story of Jack the Ripper, someone is going around London murdering and disembodying women, four by the time Holmes enters the case. After drinking with femme fatale Lydia Marlowe (Hillary Brooke), Sir George Fennick awakens the next morning suddenly believing he is the murderer. A weasely, sinister man (who looks much like Jeremy Irons) comes to blackmail Sir George, now steeped in self doubt. Holmes shows off his famous abilities of both violin play as well as observation, the latter to a dumbfounded Watson, reeling off facts that will later prove true about Miss Fennick as she approaches their apartment at 221b Baker street, which by the way no longer exists. Sir George proves a short-lived red herring, as his murder sets a course that delivers Holmes to his most famous encounter with Moriarty. Holmes and Watson are hired to guard Lady Margaret and her massive diamond, the Star of Rhodesia, by her son who is subsequently murdered when the stone is burgled. Lestrade is his bumbling self (this marked Dennis Hoey's last performance in this role), only outdone by Watson, who as always, trips over his own brain in that wonderfully endearing way we've come to expect. There was some talk on Home Theater Forum about how the BBC version of Holmes and it's Watson (Edward Hardwicke) being of a superior ilk to Bruce's portrayal because the latter's was too silly. But, I offer into evidence Sir Arthur Conan Doyle, who refers to Watson in an interview included on the Terror disc, as Holmes' "stupid sidekick." In this brisk tale (at 53m:58s the shortest in the series), a new Holmes' nemesis is revealed, Colonel Sebastian Moran, replacing the vanquished Professor Moriarty. This film surrounds a group of music box collectors, all angling for the purchase of a particular three identical boxes made in Dartmoore prison, including post-Moriarty nemesis Colonel Sebastian Moran. It is not by coincidence that Watson mentions his Holmes' chronicle in the famed British magazine, "The Strand," by the name of Scandal in Bohemia. This film happens to take much of its story from the first Sherlock Holmes tale by that very name in the July, 1891 issue of the actual "Strand" magazine. This would turn out to be the last in the Universal series when Basil Rathbone decided not to renew his contract, instead heading to New York to pursue his love for the theater rather than the boredom of performing the same role again. Image Transfer Review: From the cover: "The enclosed four DVD titles were miraculously restored from the only known surviving prints, which were extremely damaged." This is not an easy set of transfers to diagnose, because they are badly worn, but without extensive and expensive restoration these transfers are as good as we'll get for some time, I'm afraid. So, do I judge it based on the highest overall quality, or the highest possible quality for these films? Not elementary, Watson. The contrast at the opening of Terror is horribly low, either too dark or light, mostly the former. The film is bespeckled with dirt and scratched throughout, and contains a slew of compression artifacts. Secret Weapon has slightly better contrast, but the frames are jittery throughout the opening scene. The Woman in Green is the best of the four, with better but far from perfect contrast. The worst is the last, Dressed To Kill, the opening scenes being nearly washed out and extremely blurred. Even this one however, grows better as the film continues, except that the usual credits are not included as the film is abruptly cut off. The fact of the matter here is that the noise of all four image transfers IS distracting, but not entirely so. The beauty of such wonderful writing, acting and direction is that one becomes lost in the world of Sherlock Holmes. I mean, we've been watching these wonderful films for years like this, so their condition does not come as a surprise. Still, one can only feel pangs of distress that these films are rotting away before our very eyes. I can only hope that someone, like Universal (the originating studio) who has spent millions restoring it's catalogue of Hitchcock's, will put these in line to be restored and preserved for posterity's sake along with their catalogue of the other seven. Extras Review: The set contains scene access (43), theatrical trailers for each (one has been re-created), and a somewhat lame photo gallery on each disc. The two real stunners of this set, and make it worth owning above and beyond the films themselves, are a rare interview of Sir Arthur Conan Doyle, and thirty 30-minute The New Adventures of Sherlock Holmes radio programs spread out across the entire set (15 hours!!!) Really, quite a remarkable treasure trove. 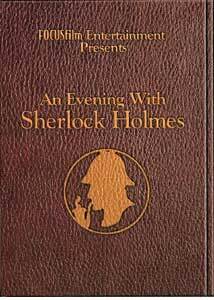 An Evening With Sherlock Holmes, indeed. More like an all-nighter!! The only supplement missing that would have been nice is a documentary on the history of Sherlock Holmes. Terror By Night: This disc contains a much lighter and better contrasted trailer, scene access (7), and photo gallery. Also residing here is the near 8 minutes of footage with Conan Doyle speaking of the origins of Holmes and his interest in the occult. The radio programs included here are: 24. The Notorious Canary Trainer, 25. The Unfortunate Tobacconist, 26. The Paradol Chamber, 27. The Strange Case of the Demon Barber, 28. The April Fool's Day Adventure, 29. The Mystery of the Headless Monk, 30. The Strange Adventure of the Uneasy Easy Chair; all played to a photo gallery. Sherlock Holmes And The Secret Weapon: On this disc are an original trailer, scene access (12), and another small photo gallery not really even worth mentioning. The radio programs here are: 16. The Guileless Gypsy, 17. The Camberwell Poisoners, 18. The Tell Tale Pigeon Feathers, 19. The Indiscretion of Mr. Edwards, 20. The Man With The Twisted Lip, 21. The Tankerville Club, 22. The Submarine Caves, 23. The Viennese Strangler. The Woman In Green: Extras included here are scene access (12), Photo gallery, and re-created trailer. Radio programs: 1. The Adventure of the Speckled Band, 2. The Living Doll, 3. The Purloined Ruby, 4. The Disappearing Scientists, 5. The Book Of Tobit, 6. The Manor House Case, 7. Murder Beyond The Mountains, 8. Scandal in Bohemia (the original July, 1891 story from which Holmes was born into the world, and is mentioned by Watson as a joke in Dressed To Kill). Dressed To Kill: Supplements on this disc are an original trailer, scene access (12), and another small photo gallery. The radio programs here are:9. The Second Generation, 10. In Flanders Field, 11. The Eyes of Mr. Leyton, 12. The Problem Of Thor Bridge,m 13. The Double Zero, 14. Murder In The Casbah, 15. The Strange Case Of The Murder In Wax. While this set offers a mixed bag in terms of the quality of image, the films are undeniable classics. One can argue the merits of Rathbone and Bruce as Holmes and Watson, but both of the former are inarguably linked to these characters nonetheless. This is in the best condition these films may be seen currently, but one can hope. Do the Conan Doyle interview and supplemental radio programs make this set a recommended buy? Why, it's elementary, dear friends. This is a must have for Holmes fans.